Please direct questions to your Instructor. The center judge must maintain their primary position directly facing the scorekeeper and timekeeper during any calls. This is to insure the scorekeeper and timekeeper receive, understand, and write down all instructions and scores. The center judge should personally check the stopwatch to insure it is working properly and to make sure the proper winners of each match are recorded. The other two judges should take a position in the opposite corners from the center judge, creating a triangle. All three judges should try to maintain this triangle, so that as the competitors move around the ring, so do the judges. The ATF bye system should be set up before any one-steps or free sparring begins. The ATF bye system is based on the concept that each division must achieve a point of having four competitors left that spar for one of two third places, a second place, and a first place. Simply having an even number of competitors will not insure that a division will reach this point. A bye would be considered an “automatic win.” The competitor who receives a bye would not have to do one-steps or free-spar in the first round of the competition and would move into the next round. Procedure There are two “base” numbers to remember: 4 and 8. Take the number of competitors and subtract that number from the next highest “base” number. The number left is the number of byes for that division. Sample bye sheets and sample ring breakdowns are provided in every tournament packet to be used as examples for judges to follow to help double check the bye system brackets. Check, double check and triple check the bye bracket results. This tends to be the biggest problem in running a ring. If the center judge has any difficulty, he/she should call on a member of the ATF Tournament Committee or Tournament Staff for help. To help reduce errors in determining byes, the ring packets supplied by the ATF tournament department will include a bye sheet. This sheet can be used to verify the number of byes determined by the center judge is correct. Once the number of byes has been determined, choose a random way to draw the byes from the registration cards that have been collected (have a spectator pick them, shuffle the cards and draw at random, etc.). Do not throw the cards for any purpose. This looks unprofessional and has caused lost cards (which can cause left out competitors.) Once the byes have been selected, pair up the remaining cards. Again, check the pairs for competitors from the same school and switch if necessary. Give the pairings and byes to the scorekeeper to fill out the score sheet. ***Competitors will be separated by school for the first round only, second round and above competitors from the same school may face each other during sparing/1-step competition. Each competitor should answer “Yes, Sir/Ma’am!” when his/her name is called, and run to the mark indicated by the center judge. From that point to the end of the match, the competitors will follow the instructions of the center judge. They will not talk unless directly addressed by the center judge or one of the corner judges. Comments, actions, facial expressions or disrespectful body language in response to a judge’s call or ruling will not be allowed and may be punished by a verbal warning, penalty point or disqualification. All black belt divisions with only three (3) competitors must use the double elimination sparring bracket. In certain circumstances, double elimination sparring bracket may be allowed in color belt sparring divisions with only three (3) competitors. All white, yellow, and orange belts compete with one-step sparring. One-step sparring matches use the same bye system as free sparring. After the competitors bow in, the center judge assigns one competitor to be red (using a piece of red cloth attached to the competitor’s belt in the back) and one competitor to be white. The competitors then do their one-steps. A competitor cannot mix one-steps from two different ranks. During one-steps, a competitor must do at least two different one-step combinations on the first two attempts. If a competitor does repeat a one-step during the first two attempts, they are prohibited from winning the second attempt. A competitor may perform 1-steps from any belt rank but they must all be from the same rank. The center judge should conduct the match as he/she would freesparring. The competitor on center judge right will always be red and low block first. The center judge will start each one-step segment by telling the red competitor to “Step Back, Low Block!” The center judge will break the competitors between each one-step just as in free sparring. To seem more like free sparring, the judges will score the one-steps one at a time. Using flags, the judges will score the first one-step as soon as both competitors have finished. One point will be awarded to either red or white. This will continue until one competitor scores two points and is declared winner of the match. Look at quality of the basic techniques: stances, blocks, kicks, etc. Regional/Instructor variances are expected and must be allowed. If both are even, look at power: which competitor uses the stronger techniques. Next item to look at is flow (or smoothness) of the one-step. If the judge still can’t decide, choose the competitor striking closest to the target. If a competitor accidentally makes slight contact during one-step sparring, he/she will not be penalized. If excessive contact is made, a penalty point may be awarded or the student may be disqualified if appropriate. If a student is wearing a Light Green belt at a tournament, he/she will not be allowed to compete in one-steps, even if he/she has been recently promoted. He/she has the option to free-spar or may choose not to. Prior to sparring competition, the center judge must verify that all competitors are wearing all the required sparring gear and all gear is ATF approved. Traditional point sparring bracket will be set up using the ATF bye system. Once the bracket is competed, announce the competitors that received byes. Each competitor should answer “Yes, Sir/Ma’am!” when his/her name is called, and run to the mark indicated by the center judge. From that point to the end of the match, the competitors will follow the instructions of the center judge. At the conclusion of a match, the winner should then confirm his/her name with the scorekeeper to insure that the proper competitor is credited with the win, and advances to the next round. It is the center judges responsibility to insure the correct competitor is advanced to the next round. There will be a one minute break before the 3rd place match begins. All Light Green belts through Black Belts will free-spar. The most points scored at the end of two minutes determine the winner. If one competitor reaches five points before the end of the two minutes, he/she will be the winner. Time runs continuously unless the center judge indicates that time should be stopped. Ties will be determined by “sudden victory,” the first competitor to score a point will win. There is not a time limit on “sudden victory.” Points and warnings do not carry over into “sudden victory.” Overtime penalty points may decide matches. Striking (hand) techniques -- the front of the torso. This is restricted to the front of the body starting at the hip line and going up to the base of the throat, and from one side seam of the uniform to the other side seam of the uniform. Striking techniques going towards or making contact with areas outside of this definition will be considered illegal. Kicking (foot) techniques -- the front of the torso (see above) and the head and neck. The sides and back of the neck are legal as are all areas of the head including the face mask, the sides, back and top. Kicking techniques going towards or making contact with areas outside of this definition will be considered illegal. Illegal target areas include any part of the body not described in the above definitions. 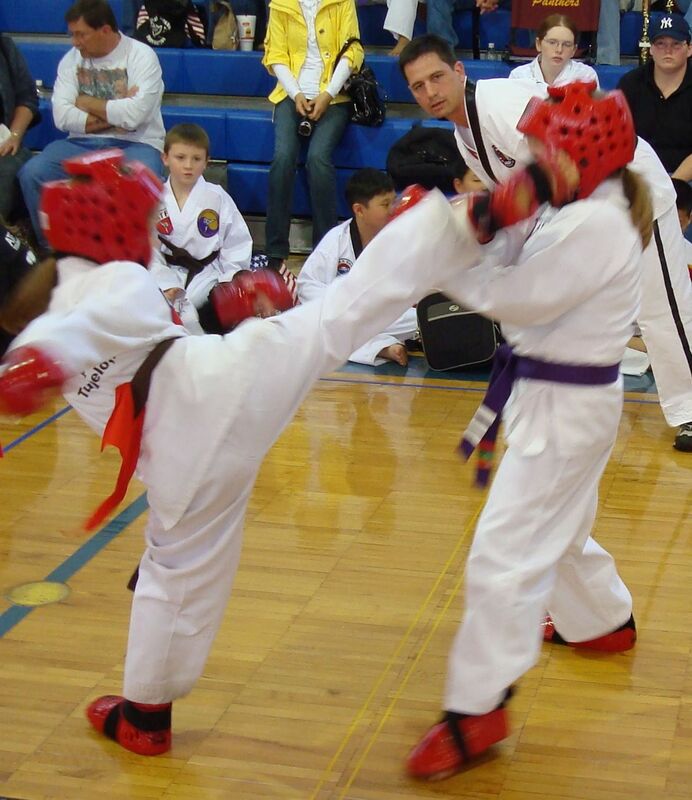 Depending on the type of technique; striking or kicking, will determine which definition to use. Illegal target areas will include, but not be limited to, areas below the belt (front, back or sides) and to the back (excluding the neck and head for kicks). Scoring points will be done by placing hand or foot techniques on or near the legal targets, with varying criteria depending on the rank and division of the competitors. Hand and standing foot techniques to the legal torso area will score one point. Legal hand techniques include only punches and backfists, Finger tip techniques as well as open hand techniques, spinning backfists, etc. which are defined as “blind techniques” and are not allowed. Kicking techniques to the body will score one point. Kicking techniques to the head, face, side, or back of the neck will score two points. Jump kicks to the body will also score two points. The criteria to qualify as a jump kick are that the non-kicking foot is off the ground at the time of the kick coming close to or touching the legal target area. Jump kicks to the head target areas score three points. The criteria to qualify as a jump kick are that the non-kicking foot is off the ground at the time of the kick coming close to or touching the legal target area. Kicks cannot score if anything other than the base foot is touching the ground. Point - raise the correct flag color and number of fingers corresponding to the number of points scored. This means the judge saw a technique come close to or touch a legal target area. No Point - cross both forearms downward. No See - one hand covers the eyes. This means the judge either did not see a technique thrown or was not in a position to judge whether the technique came close to or touched a legal target area. Warning - wave the correct flag color down low. The competitor is delaying the match (slow return to mark, slow getting up, etc.). Each judge has one vote with all the votes carrying equal weight. The center judge cannot overrule corner judges. The center judge and the corner judges are required to show their vote at the same time. When indicating a point for either color, the corner judge should raise AND point the appropriate flag and number of points awarded in the direction of the competitor they are calling for. This way if an error is made in the color of flag raised, the judge may change the flag for the correct call. If a corner judge calls a point for red, but raises the white flag, red is possibly being deprived of an earned point. Honest mistakes do happen. If the judge points in the direction of the proper competitor, but raises the wrong color flag, it is evident to everyone for whom he/she meant. It would be permissible in this event to change the flag color. A judge must actually see (not just hear contact, etc. ), any technique he/she calls. If a judge is not sure that a technique scored, he/she should call “no see.” If he/she calls “no point,” he/she could prevent a competitor from receiving a legitimate point. Judges will award points or penalties according to the majority of judges who saw the techniques. Two judges call “no see,” and one judge calls “point.” In this case, the competitor who scored will be awarded the appropriate point(s). If a judge calls “no see,” he/she has eliminated himself/herself from that particular scoring vote. In this situation, only one judge saw the scoring technique, so this would make him the majority. First judge scores Red 1, second judge scores Red 1, and third judge scores Red 2. The highest common score is 1 and Red is awarded 1 point. First judge scores Red 1, second judge scores Red 2 and third judge scores Red 3. At least two judges scored 2 points or higher and Red is awarded 2 points. Safety of the competitors must be a main concern of all the judges involved in a division. It is because of this safety concern that the calling of warnings is a very important aspect of the judges responsibility. The call of warnings always requires attention whether it is the only call or not. This indicates the judge saw the action and agrees that it was illegal. This indicates the judge saw the action, but did not agree that it was illegal. This could be because of a different visual position to the action and did not see the action as illegal. This indicates that the judge did not see the action, and cannot agree or disagree with the call. The results of this call are handled similar to calling for points; the majority indicates the final call. It is important to remember that two calls of “No See” do not negate a warning or a point. The “No See” calls are treated as if the judge wasn’t there at the time and the majority of what is remaining indicates the final call, even if the majority is only one judge. If one judge calls “no see,” one judge calls “point” for white, and one judge calls “warning” for white, the appropriate warning or point (warnings are always verified first) will be called following the verification process. If one judge calls “warning” for red, one judge calls “no point,” and one judge calls “point” for red, the competitor will receive the appropriate warning or point (warnings are always verified first) following the verification process. If one judge calls “point” for white, another judge calls “point” for white, and another judge calls “warning” for the white, the competitor will receive the appropriate warning or point (warnings are always verified first) following the verification process. A competitor can not be issued a warning and be awarded a point at the same time. Once the center judge sees the call for a warning, he/she should stop time and discuss with the judges what was witnessed. After the discussion, official verification should be asked for. Once verification one way or the other for the illegal action is given, then verification for any points should be asked for. If “Red” received a warning for the punch to the face, “Red” cannot also receive two points for the kick. If a judge sees two potential warnings at once during a sparring match, he/she should notify the center judge when instructed to score after a break (a corner judge can call time if necessary). Example: Center referee calls “no see,” one corner judge calls “White 2,” and the other corner judge calls “White 2” but also saw Red make contact to an illegal target area. The center judge would seek verification on the Red warning first then proceed to the point call for White. In a situation that requires calls for both competitors, time must be stopped and not continued until the final warning and/or scoring decisions have been completed. One judge calls “White 1,” second judge calls “White 1,” and the third judge calls “Red warning.” The center judge should stop time, discuss the warning first and seek verification, then move on to the point calls. One judge calls “White warning,” second judge calls “Red 2,” and the third judge calls “no see.” Judges would first verify the warning for “White” and then the points for “Red.”. Contact and penalty rules are for the safety of competitors in their different divisions. The safety equipment is only effective in stopping cuts and bruises from accidental contact made with controlled technique. It will not protect against full-power attacks. Color belt students are encouraged to score head kicks without contact. If light contact is made, points may still be awarded. If the judges’ vote determines excessive contact was made, the center judge will award a penalty point, or he/she may disqualify the attacker if excessive contact was due to malice or a negligent lack of control. Neither color belts or black belts are required to make body contact to score points, but may make light to moderate body contact. Black Belt students are not required to make head contact with kicking techniques, but are allowed to make light to moderate contact. No contact will be allowed, or any points awarded, for any hand techniques to the head. Hand contact to the head or contact to any illegal target area the first time will result in a penalty point: the second time will be automatic disqualification. In all calls relating to contact to illegal target areas, the judges should take into consideration the amount of contact as well as the perception of control of the technique. Also, contact to certain areas that are not defined as legal, may not warrant a warning. Examples would include, but not limited to: punches that hit the shoulder, kicks that hit the hip just below the belt or kicks that make contact to the other competitor’s leg while that leg is in a kicking motion and would be considered above the hip line. The judges need to use their experience and knowledge to determine if the competitor needs to be warned. Non-contact penalties such as running out of bounds, falling down to avoid attack, low fakes, delaying a match (getting up slow, returning slowly when break is called, etc.) grabbing, striking (no contact) to an illegal target area, etc., will receive a warning for the first instance and a penalty point for each subsequent infraction. Excessive contact or unsportsmanlike conduct will be a penalty point on the first offense, and may result in disqualification if the judges deem it was done through negligence or malice. The second instance must be disqualification. Remember that the purpose of this rule is to protect the competitors physically and mentally, even if it may seem harsh to disqualify a competitor with poor control. If a competitor is disqualified during sparring, he/she is eliminated from that particular sparring round only. They may continue to spar in the loser bracket if applicable ( 3rd place) There may be certain occurrences where a competitor may be disqualified from the entire tournament, in these circumstances the disqualifications will be made by the Tournament Committee or Tournament Host this disqualification is for competition during that tournament only, not from future tournaments. Disqualifications from future ATF events will be made by the ATF Board of Directors and/or GM Chung. If a competitor throws a technique that is intended for a legal target area, but due to actions outside of his/her control strikes (or comes close to) his opponent in an illegal target area, the competitor will not be penalized. Examples: A competitor throws a reverse punch towards his opponent’s chest. The opponent ducks down and is hit in the face. A competitor throws a sidekick towards his opponent’s ribs. The opponent does a spinning hook kick at the same time and is kicked in the back. An important factor in determining if the no-fault rule should be exercised is if the competitor recognized what was about to happen and tried to further control the technique. This is not always possible, but would support the concept that the competitor is concerned about the safety of his/her opponent. The judges need to use their experience and the attitudes of the competitors as guidelines when using the no-fault rule. A competitor is out of bounds when any part of the foot (or more) is beyond the ring boundary. Judges may tap the floor with the judging flag if they see a competitor is near the ring boundary to help him/her realize his/her ring position. A competitor out of bounds can still be scored upon but not score points. If a competitor has one foot in bounds and one foot out of bounds, the competitor can only score with the foot that was out of bounds. By picking up this foot, he/she is now back in the ring. A competitor cannot score with a jump kick if initiated with both feet out of bounds. However, a #3 style kick can score if the out of bounds foot is the one that initiates the elevation for the kick (and the other foot was in bounds). Once the out of bounds foot lifts off the floor, the base foot is in bounds and the competitor would be considered in bounds. A competitor can score on an out of bounds competitor with a jump kick if initiated inside the ring and the scoring occurs while both feet are still in the air. Out of bounds penalties depend on whether the competitor was forced out of the ring or ran out to avoid an attack. If it becomes apparent that a competitor is running out of the ring to avoid attack or is not making adjustments to avoid being forced out of bounds, he/she should be given a warning the first time (provided he/she does not have a warning for some other infraction) and a penalty point for each following instance. It is important to show the discipline of a good loser as well as a good winner. 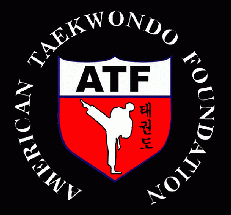 ATF Taekwondo students are known for their discipline, courtesy and respect. Any kind of exhibition of disgust, frustration or dissatisfaction with the outcome of competition will not be tolerated. Neither will over-exuberance with winning be allowed. All sparring gear should be left on until the competitor is dismissed and has left the ring. Poor sportsmanship of any kind may result in warnings, penalty points or disqualification. If a competitor is injured, have him/her lie down (or remain where he/she has fallen) and remain still. Ask the competitor to remove his/her mouthpiece, unless there was a blow to the mouth or face, and send a corner judge for the medical team. Until they arrive, try to help the competitor stay calm, making sure he/she does not move around. Allow the injured competitor to continue only when you are certain that he/she will not be further injured by continuing. If the competitor is under 18 years old, he/she MUST receive permission from his/her parents (if present), instructor (if present), and medical staff, before he/she will be allowed to continue competition. If the parents and instructor are not present, the recommendation of the medical staff will stand. If you wish to contact GM Y.S. Chung please contact him through his contact information. This web site is maintained by Tom Dreilinger for the American TaeKwonDo Foundation. The information contained within this site was valid at the time of posting. Tom Dreilinger, Luckystar Education, American TaeKwonDo Foundation, Chungs TaeKwonDo, assumes no liability for damages incurred directly or indirectly as a result of errors, omissions or discrepancies. Tom Dreilinger, Luckystar Education, American TaeKwonDo Foundation, Chungs TaeKwonDo, is not responsible for the content, nor endorses any site which has a link from this page.